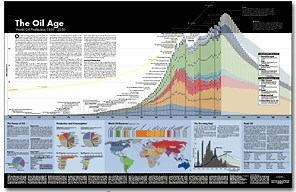 Every Peak Oil awareness activist should have copies of the amazing Oil Poster from the Post Carbon Institute. It is professional, accurate, non-partisan and mostly non-political. Suitable for framing and posting in high schools, libraries, government offices, car dealer showrooms, food stores, and anywhere else it can be seen by large numbers of people. Guaranteed to provide education and entertainment for hours. key documents and presentations for understanding Peak Oil (slideshows, reports, etc) from an urban architecture firm in Vancouver, B.C. Richard Heinberg, author of "The Party's Over: Oil, War and the Fate of Industrial Societies" and "Powerdown: Options and Actions for a Post-Carbon World"
The Oil Depletion Analysis Centre (ODAC) is an independent, UK-registered educational charity working to raise international public awareness and promote better understanding of the world's oil-depletion problem. A television series on positive responses to energy decline and climate change through local community action. How can we thrive, build more self-reliant communities, and help one another in this time of transition? ASPO is an international organization of geologists. Post Carbon Institute, Sebastopol, California - the main effort in the United States to encourage community based organizing for relocalization approaches to mitigate Peak Oil, Climate Change and other problems of the limits to growth. Matthew Simmons, investment banker, friend of George W. Bush, member of Cheney Energy Task Force who is trying to warn Corporate America about the imminence of Peak. Is this Bush's "plausible denial" way to inform the elites about what is coming? John Michael Greer, "The Long Descent"
Most websites about Peak Oil are in English, very little information about Peak is available in other languages. A couple sites have translated material into a few other languages (in particular the ASPO site at peakoil.net). The internet is an amazing resource for global dissemination of information, but it is also very English-centric. Automatic translation software that is usable without human correction is not yet commercially available - perhaps intelligence agencies have translation software that is adequate, but that is not available to the public. It can be amusing to use commercial translators to transform a page from one language to another, and then back to the original language (it will be garbled), but automatic translation is not yet a practical tool for cross-cultural communication. Oil is a subject filled with big words that even native English speakers don’t understand, so I have designed this ESL class into easy to read simplified English, for anyone on this planet to study from. Anyone whose English is good enough to say “I drive a car”, “I bought vegetables at the market”, “I am cooking dinner” “I go to the store” will understand the main point. Natural gas and oil are now a finite, quantifiable (measurable), limited commodity (product). The following pages will explain that some oil wells in the world are past the half way point in production and each day from now on will give less oil, so many oil fields and wells are declining that new oil being found in our planet is not enough to replace what is being used daily. Peak Oil Anarchy: peak oil could herald a golden age of anarchy. Peak Oil News: "If we don't change our course, we'll end up where we're headed." communitysolution.org - The Community Solution to Peak Oil. The Community Solution is a program of Community Service, Inc. Community Service is dedicated to the development, growth and enhancement of small local communities. They envision a country where the population is distributed in small communities that are sustainable, diverse and culturally sophisticated. peakoilaction.org Peak Oil Action is a grass roots awareness raising network helping people meet up and discuss peak oil. Join or start a meet-up in your neighborhood. See also oilawareness.meetup.com (although contacting a local "Post Carbon Outpost" might be more effective - different approaches will have different results from place to place). The main reason that people don't want to talk about Peak Oil, industrial collapse, or ecological collapse is because they categorize these all as "doom and gloom" scenarios. We are labeled as pessimists and discounted. The reason for this is because people feel like their way of life is under attack and immediately get defensive. The best strategy is to explain why the post-oil, post-industrial world will be more peaceful, healthy, and happy. While our current way of life may seem to be prosperous, we in fact are living in temporary material abundance at the expense of many of those in the rest of the world and future generations. Living cooperatively is a more socially and spiritually fulfilling way to live. The first thing that people need to do is take complete responsibility for their lifestyles, including the energy and material inputs that feed their everyday lives and the wastes that they generate. Even the act of watching TV for one hour burns 20 pounds of coal in the process. After understanding the costs associated with our modern lives, we will begin to reduce the fossil fuel inputs in all our food, clothing, and other products and reduce the amount of pollutants that leave us. In other words, we take responsibility of all that flows into us and all that flows out of us. The way that I talk to friends and family is to slowly introduce them to peak oil itself without offering any solution. Coming out with it all at once may backfire and they may close off. "The End of Suburbia" documentary is a great place to start because it offers credibility and is an easily accessible format for people to understand oil depletion and why the American way of life is unsustainable. Other short primers on peak oil are available all over the web. Sometimes it is good to let people search them on their own. For suggestions, I like www.wolfatthedoor.org.uk and www.lifeaftertheoilcrash.net. Good primers are available at the ASPO website (www.peakoil.net) and at www.oilcrisis.com. For a longer discussion, "The Party's Over" by Richard Heinberg is excellent, as is "The Coming Oil Crisis" by Colin Campbell. Once they understand that the problem is real they will most likely just express their faith in technology and the government to take care of the situation. It is at this point that it is necessary to explain the benefits of changing our way of life - to live more sustainably, simply, and with closer ties to our local communities. In explaining this solution it is important that your passion comes through - for this is no longer a technical discussion of energy and technology - it is compassionate discussion of living in a way that honors the earth, our fellow human beings, and future generations. People will understand peak oil through their minds but will only understand and commit to this solution through their hearts. Be an example. Share the joy of your new lifestyle with them. Be patient. We cannot easily withdraw from industrial society overnight. It takes a lot of effort and inconvenience but the mere act is very healing and nourishing to the spirit. AM: Once people understand the basic energy situation, what are some of the most important things people can do about it? MQ: Once you understand the basic global energy situation you must first analyze your personal energy budget. How much energy do you use in a typical day? From what sources does this energy come? What are the main areas of energy use? What machines or products that you purchase / use have the most embedded energy? Some of these questions may be difficult to answer do the lack of data, but you can make some guesses. From that point you can begin to identify areas where you can reduce energy use. For example, buying local, fresh, seasonal food drastically reduces the embedded energy that you would consume in frozen, packaged, long-distance food. Another example is sharing a car. This reduces the embedded energy in the manufacture and maintenance of the car and the oil energy used to make more frequent trips (experience shows that those who use car co-ops or car-sharing plan their trips more wisely and efficiently). Have a plan to reduce your energy use by 25% in the first year and continue setting similar goals. In addition to this gradual reduction in energy use, begin learning the survival skills necessary if your fossil fuel energy use had to drop to nearly zero overnight. How would you get food, water, heat, etc.? By thinking about basic necessities you can begin to simply your life all-around. Finally, share your experience with as many of your friends and family as possible. Involve them in the process and show them what this means to you. Show them that the experience can be rewarding socially as you build new relationships, physically as you develop strength and stamina, intellectually as you learn new skills and confidence, and spiritually as you re-connect to the natural world. DRY DIPSTICK LAUNCHES "BEYOND PEAK"
Summary: DryDipstick, a web guide to Peak Oil, launches BeyondPeak.com, a guide to self-sufficiency and preparing for, and dealing with, Peak Oil and economic collapse. Napa Valley, California November 5, 2005 -- DryDipstick.com, a popular Peak Oil metadirectory of information on the impending decrease in oil production, today launches a sister website "Beyond Peak", located at www.beyondpeak.com. The new website focuses on preparation for, and dealing with, the effects of Peak Oil, economic collapse, and a host of other looming disruptions, any one of which could cause serious problems in our society. Mick Winter, founder of both Dry Dipstick and Beyond Peak, says: "Many visitors to Dry Dipstick have told us, 'Okay, we get Peak Oil. Now what can we do about it?'" We've created "Beyond Peak" to give hundreds of answers to that single question. The website provides access to the information, resources and tools that people need to move their families, neighborhoods and communities closer to sustainable, self-sufficient living." While few of us can have real effects on national and state policies, all of us can affect what happens at home and in our communities, so Beyond Peak provides information for use at the home and local level. Everyday citizens can do many things, on their own and working with friends and neighbors, to provide for essential needs. Beyond Peak offers information on such topics as food, health, money, power, shelter, transportation and water, as well as barter, drugs, relocation and the recurring collapse of societies. No single website or method is a cure-all, but armed with the information offered by Beyond Peak, individuals can know that they are doing everything they can to prepare for, and deal with, whatever the future may bring. For complete information on preparing for, and dealing with, Peak Oil and economic collapse, visit Beyond Peak at www.beyondpeak.com.